When I came home from work, an official looking envelope from the 'Domain Renewal Group' was waiting for me. Inside was an equally official looking letter which I initially thought was a bill. 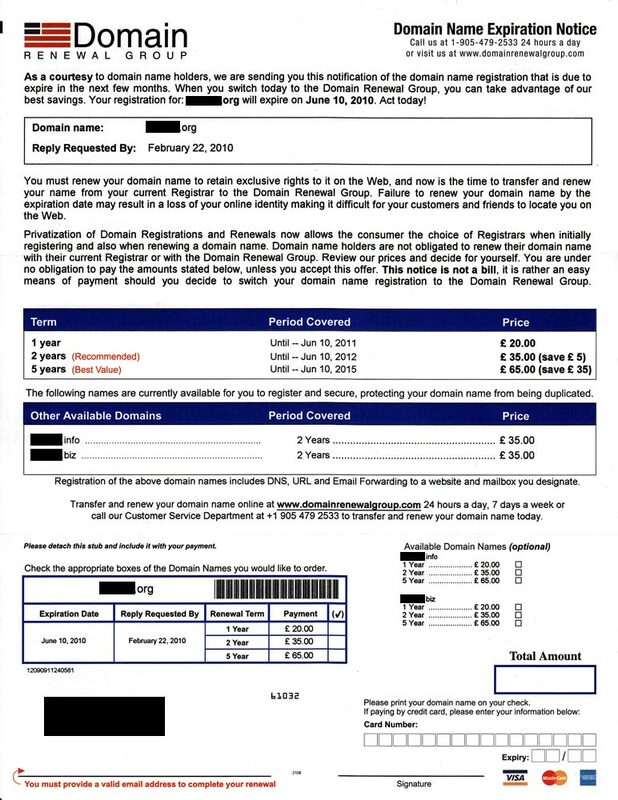 It turns out it is just a marketing letter posing as a renewal notice for one of my domains. It seems they look at the WHOIS records for domains which are expiring soon and send out these letters in the hope someone will think it is a bill and give them a cheque or credit card number. They expect me to pay £20 to renew my domain and make them my new registrar, this is vastly more expensive than renewing with my current registrar which would cost only £5.46 for a year. I think this is a deliberately deceiving letter designed to look like a bill in the hope that it will just be paid and forgotten - many people with websites don't really understand the roles of registrar, hosting company etc. and this will just confuse them further. In short, if you're happy with your current registrar, don't bother changing. If you do decide to change, don't be forced into it by someone sending you direct marketing letters. Trevor: That letter looks very similar to the ones I get from Domain Registry of America the first time a domain is due for renewal. Turns out they're the same people and have already had their wrists slapped: http://bit.ly/aBzK0m .-= Trevor´s last blog ..Virtual Model Homes from Focus 360 =-.